Less than a month to go, y'all! Are you getting ready for the fat man in the red suit to come stuff some stockings? Speaking of stockings, let's talk logistics. Stocking space, depending of course on the size of your stocking, can be pretty limited. This means that you've got to work hard on bringing a lot of awesome to something relatively small. If you've been stumped, get yourself ready, because I've just gone and solved your stocking stuffing problem for you. You're probably wondering exactly how I managed to do that. I'll tell you, friend. The answer is so very simple, yet so very awesome. It's a gift sure to make everyone on your list happy as a little dang clam. The answer is a gift certificate from Goner Records, straight outta Memphis. 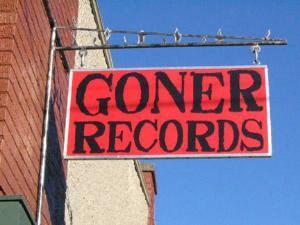 Goner Records rules on two counts, which makes a gift certificate from them even better. First, they're a fierce little record store in Memphis. The other half of Goner is a label. Meaning, with these gift certificates, the recipient will be able to shop not only from the selection at the retail side of Goner, but can buy some of their bitchin' label artists' work as well. Win-win, if you ask me.